The last few days spent in classes have been lovely. I knew they were going to be. Spending time in classes with kiddos and their teachers trying out some ideas that were new to my colleagues, and then chatting about what we saw and heard, and what we learned was just wonderful. 1. Kids (and their teachers) are super interested in containers filled with stuff. It is nearly impossible to resist joining in the conversation about “how much stuff” is in the container, especially when the stuff is the lovely orange cheese balls that you can buy in the mega-container at Target. It offers kiddos who really, really, really struggle with math anxiety a way to join in the conversation. Everyone made guesses and built number lines and laughed and shared ideas. These are the sights and sounds of what learning should be for our students. 2. Games provide an awesome arena for kids to explore numbers and their structure, especially the game we shared on Monday morning, What Fits Between? We taught them how to play the game. They had to figure out how the three numbers created are related (largest number, smallest number, and the number that fits between) and organize the results. We learned that if we leave them alone to figure things out, they do. The adage, be less helpful, comes to mind. Kids are able to explore ideas more deeply when they engage in conversation with classmates than when they engage, individually, with worksheets. It’s great fun to have a group of teachers in a classroom when you want to try out new things especially when you are able do some planning together before hand. It’s really nice to have a couple of days to work on new ideas and have time for people to talk together on each of the days. Kids are amazing. If we choose the right tasks, they aren’t even nervous and anxious about the math part of their day. 3. Using games as assessment is an informative practice. Notes and photos and conversation bring the next instructional steps to light. Of the 12 kiddos playing, nine were ready to move onto playing the next level of the game where each player must build a three-digit number and determine who had created the number this fits between the other two. Three students needed additional opportunities to play the original version of the game. The “top” math student got to play and interact with the ideas just like everyone else, as did the kiddos who are often not interested in math. All 12 students were invested in the game. The students who usually need to get a drink, sharpen a pencil, or use any number of distractions to help them get through math did not need to employ any of those strategies. During the reflection time at the end of the class period the kids decided that they wanted to change the criteria that determined who won the game. 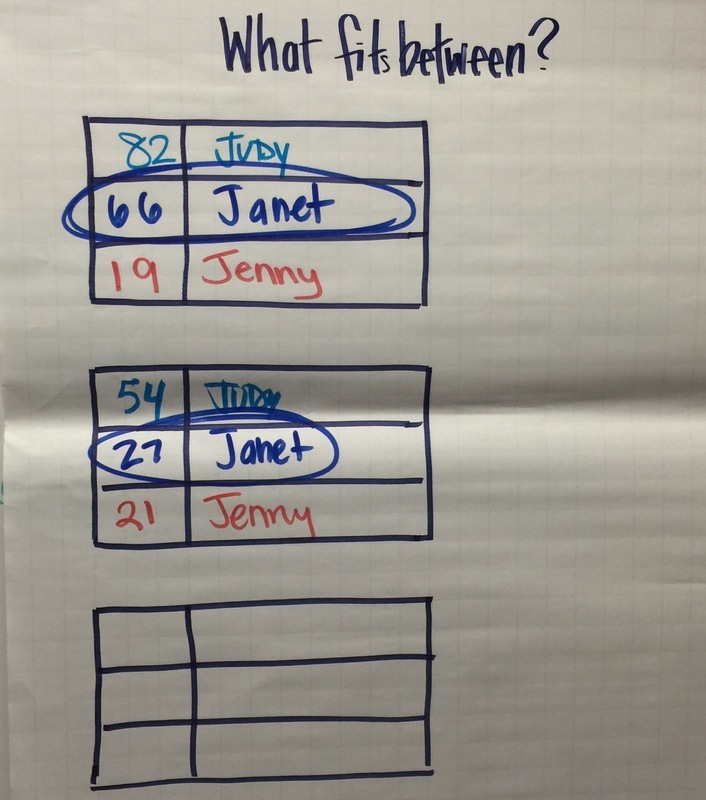 Now, in their class, the winner is determined after each player counts up the number of rounds s/he won. The player who has the number of wins that is between the other two, wins. How do we use the learning we saw today to support tomorrow’s instruction? The collaborative work started when we noticed that kids were having a difficult time estimating height in an estimation warm-up. We decided to address the manner in which they worked with the concept of estimation. We selected a graphic organizer for them to use, determined that the quantity of objects for them to estimate would be less than 100, provided some boundaries to the quantity, and put the cheese balls in clear, plastic containers so the students could see them. With these adjustments the students were more comfortable in making estimates and discussing their ideas. After the team talked about the work the students did that day, it was decided our next move would be to use a series of photographs from Estimation180.com. We selected the group that asks kids to estimate the number of cheese balls on plates and trays. The students will play What Fits Between? and do some other math work. I am looking forward to hearing how the day went, and what the team is going to tackle next. 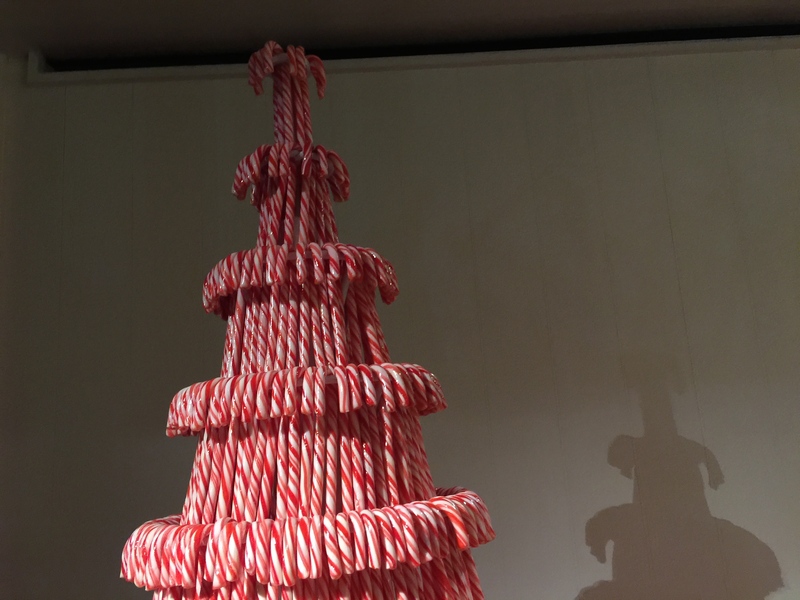 How many candy canes did the design team of Curate Decor + Design use to make this fabulous tree in the lobby of The Modern Honolulu? If you need a little more information before you give a final estimate, here is the very top part of the tree. Record any revisions. How confident are you that your estimate is really, really, really close? I am sure that by now you JUST can’t stand it and desperately need to know how many candy canes in the Christmas tree. That was where I was at as soon as I saw the tree–just had to know how many candy canes were used. The folks at the front desk at The Modern Honolulu were super helpful and they just told me. They didn’t even make me guess. Are you ready? Are you sure you don’t want to revise your guess one more time? You are looking at 4510 candy canes.